This week on The Next System Podcast. 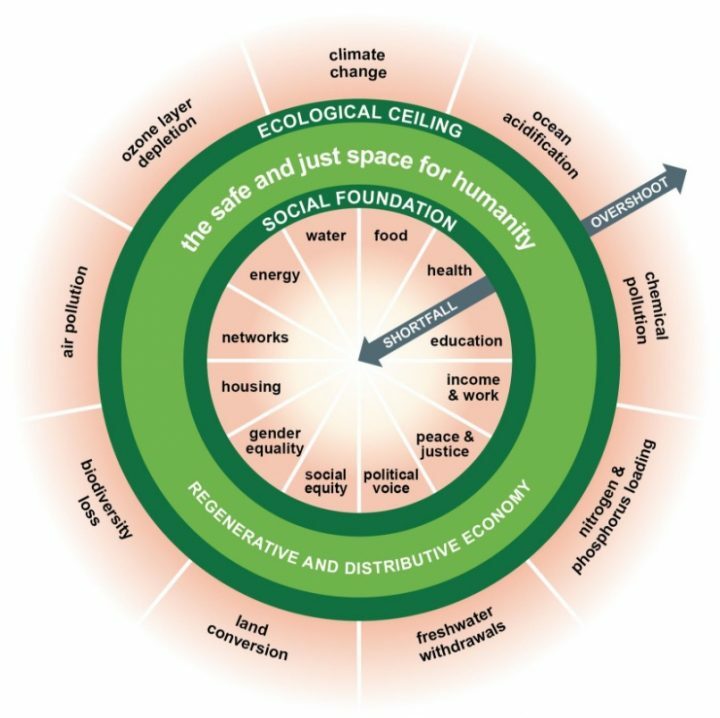 Adam talks with Kate Raworth about her Doughnut Economics model. The pair discuss economic justice, unpaid labor, the commons, and much more. You can learn more about Doughnut Economics at Kate’s website or purchase the book wherever books are sold. You can also follow Kate on twitter. The Next System Podcast is available on iTunes, Soundcloud, Google Play, and Stitcher Radio. You can also subscribe independently to our RSS feed here. Adam Simpson: I’m joined today by Kate Raworth, author of Doughnut Economics: Seven Ways to Think Like a 21st-Century Economist. Kate is a senior visiting research associate at Oxford University’s Environmental Change Institute and a senior associate at the Cambridge Institute for Sustainability Leadership. Her previous work at Oxfam and the United Nations, centered on confronting human deprivation, a challenge quite literally at the center of her new doughnut economics model. Kate, thanks for joining me today. Kate Raworth: Oh, my pleasure. Simpson: Obviously, we’re talking about your new book, Doughnut Economics but before we get started I did want to get a sense about your own trajectory into writing this book and your experiences and the concepts that led you to becoming an advocate for this doughnut model of economics. You can’t just walk away from economics because it frames the world we live in. It’s the mother tongue of public policy. Then I spent a decade working with Oxfam on the front line of campaigning, from women workers rights in global supply chains to climate change and adaptation and who should pay. And then I became a mother of twins, and immersed myself in the household economy and really lived the reality of that. Through all of this, I realized that you can’t just walk away from economics because it frames the world we live in. It’s the mother tongue of public policy. And if I wanted to change any of these issues that I fundamentally cared about, I believed that actually, economics needed to change. So I decided to walk back towards economics but to try and flip it on its head and put front and first, the values that I think are the most important in the world, of what we’re trying to achieve as human well-being. Then ask ourselves, what kind of economics would even give us half a chance of achieving that? And that’s the goal at the heart of the book. Simpson: Great. Well, one of my favorite things about your book is the images you use to simplify these rather complex ideas. However, our podcast listeners don’t have the benefit of some of your great artwork although we’ll have links in the description to your website and other resources. But how would you, in your own words, describe your model, the doughnut economics model? Raworth: It sounds ridiculous, I know but I sat down and tried to draw a picture of human well-being in the 21st-century. What are the necessary fundamentals of well-being? And it came out looking like a doughnut, the kind that folks eat here in America with the hole in the middle. So in that hole in the middle, is a space of deprivation. It’s a place where people have fallen short on life’s essentials be it food, water, healthcare, education, political voice, income, access to work, electricity, housing, you mean it, these are the essentials of well-being, as agreed in the sustainable development goals, that the world’s governments have agreed in 2015. So every person in the world has a claim on meeting those essential needs so that we all led leaves of dignity, of opportunity and community. So we want to get everybody out of that hole in the middle of the doughnut into the doughnut itself. But, at the same time, we can’t over shoot its outer crust because beyond there we are putting so much pressure on this living world that we depend upon, that we start to kick its fundamental systems out of balance, causing climate change, massive biodiversity loss, air and chemical pollution, too much land conversion, a hole in the ozone layer. Earth system scientists have put together what they call nine planetary boundaries, which describe what they believe are the fundamental, critical earth system processes that kept earth and its extraordinary benevolent and stable state for the last 11,000 years that we’ve known as the Holocene, now we’re at the tip of actually driving ourselves out of that. So we need to come back within those planetary boundaries, back within inside the doughnut’s outer crust. So we need to meet the needs of all within the means of the plant. Bring everybody over the social foundation but to do so, within the planetary boundaries. To me, that’s the 21st-century definition of human progress and it’s about creating a thriving balance between those two. Simpson: Right. I think this gets to growth, which is kind of one of the central topics that you investigate in your book, but it also leads to my next question, which is, the subtitle being Seven Ways to Think Like a 21st-Century Economist. What’s so wrong with the 20th-century economist frame of mind? So what’s wrong with it is that it doesn’t reflect the world that we know. Let me give you one example: Paul Samuelson drew a diagram in the 1940s of the whole economy. It’s in fact, today, the biggest picture of the economy that a macro economist can show you and it shows how money flows around the economy, it’s called the Circular Flow Diagram. It shows money flowing between households and business, some of it is siphoned off through banks coming back in as investments, some going through governments, some going through trade. But it only reflects goods and services that have money attached to them. Absolutely, no mention of the living world from which all materials and energy flow and all waste and pollution comes out. No mention of the unpaid care worker, parents raising children, raising that labor that comes to work fresh and ready at the factory door every day. No mention of the commons, this space where people organize without the market or the state to produce things they care about. These actually are hugely important today. The living world is being run down by the economy because we’ve so blindly ignored it. Unpaid caring work is squeezed because it’s missing from the picture, dismissed as women’s work. And the commons, well they were seen as tragic and so they don’t even get featured, and yet the digital commons today, are one of the most dynamic places of the whole economy. So ignore that, you’re ignoring one of the greatest space of innovation. These silences in the diagram, come back to bite us. Simpson: I understand that a lot of these things are recognized in a kind of, really dismissive way as “externalities,” which makes sense if, given the Samuelson model, they’re not factored in at all. It reminds me that … I’ve been reading about this productivity question, I forget the author’s name now, but he’s discussing why don’t we have this spike in productivity that we projected. One of the answers about a lot of these things are to do with the commons that aren’t factored into GDP or productivity, like Google. I know that I’m more productive because of Google but it’s never factored on any kind of spreadsheet anywhere. Raworth: Right, because a lot of the value that it’s generating for you and through you, isn’t monetized. But it’s value that’s created, enjoyed, goods and services enjoyed within the community even in the workplace, but it’s not monetized, which shows that the monetary slice of the economy is probably capturing a smaller and smaller fraction of the total value that we generate. It shows that the thinness of using GDP if you really want a measure of the value of goods and services enjoyed. But even on externalities, that framing is very powerful because it defines already what’s apparently internal. What’s apparently internal in the market is things that have a price as if the economy, is the market. Call something an externality, well, you’ve already told me how important you think it isn’t. Simpson: It goes, I think, to your point about a market needing to be “embedded wisely,” as you put it, juxtaposed with where the market situates currently in our economy. How would you describe what you call a wisely-embedded market? Raworth: So often you’ll hear people talk about the free market. The importance of the free market, which should send up a little red flag. Where is this free market? I’ve never been somewhere with a free market, I’ve not seen that place. Because all markets are embedded in regulation, in culture, in social norms of how we do and don’t exchange goods and services for money. What can and can’t be exchanged. You can’t buy and sell passports legally, you can’t buy and sell children. Every market is embedded, there’s no such thing as it being utterly free. I think the work of Karl Polanyi is very useful here. He talks about markets being always and everywhere embedded. We just become so used to it, that we don’t see it anymore. As he would point out, there’s no such thing as deregulating the market, we can just re-regulate it. There’s always going to be regulation shaping what can and can’t be done, you’re just shifting the regulatory space. You ask how are those shifts benefiting, or how are the costs and benefits of that shifting re-regulation falling on other people? So financial deregulation actually just shifts the costs and benefits of financial crisis onto a different group of people. I find it a very rich way of thinking. It dismisses this idea of freeing the market and then having it encumbered by the red tape of regulation. Flip that on its head, don’t think of red tape of regulation. Think actually, these may actually be protections of workers’ rights, protections of the environment, protections of things that are outside of the monetary price but are the deeply important part of the economy and of social life that we value. Simpson: I also wanted to ask about the role of the commons. This came up at multiple different times in Doughnut Economics and I’m wondering what you mean explicitly by the commons and what you think its role ought to be, within the doughnut economy? Raworth: So most economic students will have come across the commons and it’s always paired with another word, which is tragedy, right? The tragedy of the commons is the way we meet the commons. It’s like a character coming on stage and you’re told, this is the tragic character in the play. Because Garrett Hardin wrote a paper in 1968, called The Tragedy of the Commons, in which he said, well, imagine if there was a pasture land that was shared by several people with cows, they would over graze it and then it would be run down, so a commons just can’t be sustained. You need to either have it managed by the state or better still, privatized. He was just imaging this, and the way he described what he saw as a commons, most people would say, actually, that’s open access where anyone can just go take a resource, it may well get run down. It was the work of Elinor Ostrom, a political scientist, she must have seen his work and said, “Well, this is interesting. I can go around the world, go around looking at the way watersheds are managed in California or water is managed by rice farmers in Nepal and see that actually, they’re managing a common resource but they’re managing it successfully. Often better than the market and better than the state.” So instead of saying, I hypothesized that this will be a tragedy, she started going around looking at real examples and saying, “Interesting, sometimes it’s a triumph,” and then documenting what is it that made this work. And she’s come up with really powerful lists, so powerful she won a Nobel Prize for it. It’s a powerful list about the member of the commons being clear, having clear rules, punishments if you violate them. Meetings, so that we can negotiate them. All sorts of social organization that makes it possible, that shows the commons can be a triumph. I think that her work gave it status again when her work was highly acknowledged, getting this Nobel Economics Prize. But also, the rise of the digital commons. The rise of Linux software, which is now the world’s best operating system made by people sitting in their bedrooms late at night, all contributing because they get the satisfaction of contributing to something bigger than yourself, and the recognition of what you’ve contributed. Wikipedia, the same or even local commons like a community garden in a neighborhood. People like contributing to the commons and I think the digital commons is giving it a new kudos because it’s actually incredibly dynamic and powerful. So we’re seeing a resurgence of the commons and it’s incredibly important we learn to recognize them because they’re just been dismissed out of our minds for decades. Simpson: Right. It does strike me that a basic understanding of anthropology would lead you to find the opposite conclusion of… I’m sorry the gentleman’s name? Simpson: Garrett Hardin. But also you mentioned the digital commons. It seems to me it goes to the question of meaning and work in our lives. Because a lot of people, sad to say, don’t have perhaps the benefit of what you and I have of loving the things we do for a living. And so, having an outlet of the commons allows them to do work, largely uncompensated as you point out in your work, that gives them a sense of meaning, I think. Raworth: I think that’s a really good point. Why is it that in any country around the world there are millions of people volunteering at any one moment? Volunteering in a local library, volunteering to help teach kids to read. Volunteering in all sorts of different ways. Why? No monetary reward. Rational economic man can’t explain this one. It’s because of that sense of satisfaction of using your skills. Where the needs of the world and your skill meets, therein lies a satisfaction of contributing to something bigger. And yes, people want to be acknowledged, want to be recognized for their contribution but you can do that in many, many other ways than paying people, which shows that work is not just a means of growing income, it’s a place where many people find purpose. Of course, it can be a privilege to have those two things coincide, but I think it’s a very nice point you make that some people’s paid work may not be the place where they get their purpose and meaning in life. But by being able to participate in the labor market in the paid work at the same time as having an active role in the commons, there’s purpose. That’s why you see so many people running home from work to go to a community meeting, to participate in something else because therein lies their purpose. Simpson: Right, right. You brought up rational economic man, there’s an entire chapter dedicated to this concept in your book. There’s also, I believe it’s chapter two, a chapter that casts things like the commons as characters in a play. It seems to be that narrative plays a large role in your work, and that these narratives about human nature, the economy or otherwise, tend to be self-filling, which is kind of frightening. I remember there’s one anecdote you mention about some sort of formula for analyzing a certain stock market that didn’t work when they implemented it and over time it began to work because people were following this formula. I’m wondering about these kinds of self-filling prophecies and what you think they mean for how we understand economics and economic theory? Raworth: Oh, that’s a wonder and big question. Let’s start with the power of narrative. I started watching videos on YouTube of Milton Friedman in the 1960s and 70s engaging with students. The kind of radical students who would come up to the microphone and question him after his lecture and he just, with a great smile on his face, he managed to bat them back because he had the most powerful narrative, he had it down. He’d say funny things. He’d say things like, “If you put the state in charge of the desert, there’d be a shortage of sand within a few years.” You know, it’s funny. Doesn’t mean it’s true, but he used narrative, he used humor, he used clever catch phrases to control the space of debate. And I would see these students wouldn’t know how to respond because he had such great comeback lines. That’s the power of narrative and he was the master storyteller of neoliberalism. So harness those tools, be playful, hone your story down just as he, I think, framed the neoliberal narrative around some characters. Key characters being the market, the state was the villain. So let’s turn that narrative around and replace an old narrative with a new one because we respond to stories, they are more compelling than text books, for sure, and they are what drive the way we talk in politics and in public debates. If we want to write a new story, we need to create that new narrative. As it comes to who we are, that’s a really powerful story because one of the most fascinating things I learned in the process of writing this book is research that shows that who we tell ourselves we are, shapes who we become. The character of rational economic man who stands at the heart of mainstream economics, he’s never actually drawn in the textbooks, but if a little picture of him was drawn, he would be man, he would be standing alone with money in his hand, ego in his heart, a calculator in his head and nature at his feet. The problem with this character is not just how absurdly narrow he is, it’s what looking at him does to us. Because research in the United States and Israel has shown that the more that economic students learn about the rational economic man, the more they become like him. The more they value self-interest, and the less they value traits like compassion and altruism, so I find that fascinating. The more that economic students learn about the rational economic man, the more they become like him. The way we describe the climate system doesn’t change the climate change doesn’t change how it works. But how we describe ourselves to ourselves, change who we become. Nobody wants to be the fool, the idiot, so if we tell ourselves that actually, we’re self-interested and competitive it makes us more likely to be self-interested and competitive. There’s a huge responsibility there in economics as in any other discipline, to describe ourselves wisely because we are actually shaping how we will behave in that process. Simpson: I think this brings us to kind of the next point, which is the role of GDP and growth, which we’ve talked about before. But, I recall that you mentioned that 21st-century economists should be agnostic about growth, why do you think that is? Raworth: So I think 20th-century economics became absolutely obsessed with growth. In fact, what we’ve done is construct economies and institutions, financial, social and political institutions in the economy that lead us to be addicted to growth. We expect, demand and depend upon unending growth. We’ve all seen what happens in markets and economies when it looks like it isn’t coming, a panic because we don’t know how to have a thriving economy when growth isn’t coming. So I think by having growth as the driving purpose, we’ve sacrificed all sorts of things in the name of pursuing continual growth. Digging up fossil fuels and sucking it out of tar sands being a very good point, whether in the U.S. or in Canada at the moment, right? In the name of continuing growth, of course, we have to use that form of dirty energy. We need to flip that around, and actually, start not with the thing that we’ve actually become addicted too, but what are the driving design factors we want. I believe we need economies driven by two design features. One, economies should be distributive by design, which means that value created is shared far more equitably with all those how helped to create it. Think of an employee owned company, which that value is shared amongst all the employees who helped do the work instead of siphoned off to distant and fickle shareholders. So we need economies that are distributive by design but also regenerative by design so that instead of using up earth’s materials and resources, we can use them again and again and again and work with the cycles of life, rather than cut against them. So if we create economies that are distributive and regenerative by design, what does that need will happen to GDP? Well, I just don’t know because I think that GDP becomes a response variable, right? If we’re getting income into the hands of people who need it, so creating an economy that’s more distributive by design, that’s probably going to boost spending because people who didn’t have an income to spend on life’s essentials will spend more, so that might actually increase GDP. That’s not a reason to do it because it increases GDP. Do it because it’s distributive, that’s what we’re trying to do. To become regenerative, the government China is spending three-hundred and sixty billion dollars by 2020 on installing renewable energy capacity and solar capacity so that will boost GDP. But once it’s in, the marginal cost of generating electricity will be near zero, so it won’t contribute to GDP. That’s a case of the government of China, moving towards a renewable energy model. GDP will initially go up but then it won’t contribute to it. It should become a response variable. It’s a huge mind flip, I know, to create economies that enable us to thrive whether or not they grow. Complete mind shift because of course, we’re currently addicted to it. It would have been so much easier to write the book without bringing this chapter in. It would be much more palatable for the mainstream, but I thought don’t buck the big questions, take that it on. So I really enjoy thinking what will it look like to create an economy that could be agnostic about growth. Simpson: Also, there seems to be a growing body of people who may or may not be marginal, that argue that we ought not just be agnostic about growth but think that we should have this concept of de-growth. That actually in order to get within the ecological limits that you spell out, we actually have to shrink our economies. Of course, it occurs to me that this might have implications for the inner ring of the doughnut, the social foundation that we are also are concerned with in your model. I’m wondering how the idea of de-growth strikes you? Raworth: So, I’ve been engaged in debates with folks in the de-growth movement, many of whom are close allies because I share many of their goals. I believe if I say a regenerative and distributive economy, they would say absolutely, this is in other words, in your words, this is similar to what we’re talking about. I don’t use the word de-growth because I don’t think it helps us. I’m really inspired by the work of George Lakoff who talks about framing and he would say, never frame your argument in your opponent’s language. When we use the words de-growth, we’re just talking about the negative of what we don’t want, but we haven’t yet said what we’re for, right? I don’t just want to frame my vision around something that I’m against. And it’s still focusing, by being for de-growth, we’re still focusing on the metric of what happens to GDP. I’m saying that I don’t think that’s the point of what we should be focusing on. I believe in being agnostic about growth because… I can imagine, I can’t prove either way whether GDP must necessarily go down or go up. I don’t want it to grind to a halt, I definitely don’t want it to grind to a halt because the economies we have today, are deeply divisive and degenerative. Deeply divisive in the vast share of increasing GDP goes to the 1% and degenerative in that we’re generating income by running down the living world. We need to transform our economies and that process of transformation could well lead to an increase in GDP, as it will with China increasing three-hundred and sixty billion dollars in solar energy capacity. Fantastic. The point is to let GDP become a response to the economy we want to create, not be driven, be fixated on whether or not it goes up or down. Simpson: We don’t want to overshoot our ecological ceiling and we definitely don’t want to have a shortfall that we fail to meet our social needs. In your mind, is there any kind of choice involved here in terms of can we actually meet everyone’s base needs without exceeding the ecological limits? As I understand it right now, the way we consume, the way we waste, we’re living like we have several earths is often the metaphor that is explained to us. I’m wondering, is it an issue? How are we going to have 10 billion people on earth by 2050, is there a way that we can all meet these base values without exceeding the ecological limits? Raworth: Right, big question. So right now, we are not at all living within this doughnut, obviously. Many millions of people in the world are falling into that hole in the middle because they don’t have enough food, water, healthcare, education, income, political voice, and so they’re falling short on life’s essentials. Indeed, in countries rich and poor are in that space. At the same time, we have already overshot, at least for the planetary boundaries on climate change, biodiversity loss, land conversion and excessive fertilizer use, maybe also on air and chemical pollution. So we need to come back within planetary boundaries while getting everybody out of that space of deprivation in the middle. It’s never been done before, it’s never been done. That’s why we need a really new way of looking at things and we can’t use last centuries’ economic textbooks to give us the mindset to take on this very 21st-century challenge. Does that space exist? I don’t think anybody could prove it, but I profoundly believe that at least, so seven billion people today, likely to be ten billion. I have a strong glass half full possibility about it and I’ll tell you why. There’s extraordinary inequality in the world that means we are currently below the foundation and over the ceiling. Let me say about food, 11% of the people in the world don’t have enough food to eat every day. How much food would it take to meet their actual needs? Around 3% of the current global food supply. Could that be found? Well, around 30 to 50%, 10 times that amount of today’s global food supply is not actually eaten, it’s lost post-harvest, wasted in the supply chain or scraped off plates into the kitchen bin. So what we’re looking for to enable everybody in the world to have enough to eat, is just 10% of what’s not even being eaten. That’s just one way of reflecting the extreme inequalities in global access to resources today. That gives me hope and confidence that in a very different setting, this could be achieved. Not to make it sound easy, right? It’s not a question of shipping the food around, of course not. But at the level of provisioning on the planet, it’s possible. This could also be true in other areas as well. Does it have to be a trade off? I don’t believe it does. I think instead of running down earth’s resources I order to meet our needs, which is what 20th-century degenerative industry has done, we need to flip into regenerative design where we work with the living cycles of the world. I would rather be an optimist than a pessimist, because if I was a pessimist, well, I would just go home and watch telly. Very different industry, very different ways of building buildings, moving around, transporting ourselves, producing food. We need agriculture that sequesters carbon rather than releases it. We need buildings that sequester carbon rather than produce green house gas emissions. Industry design innovation, a revolution in how we create spaces and an economy that enables it, I think, will put us on track for doing that. I can’t prove it, but I would rather be an optimist than a pessimist, because if I was a pessimist, well, I would just go home and watch telly. Simpson: You mentioned several times the role of design and designing to distribute and to be regenerative. I’m wondering you could flesh out for me a little bit more about what such systems might look like. What those circular flows might look like? Raworth: In terms of a regenerative design, you would have, some people call it a circular economy or a cradle-to-cradle economy. Instead of the degenerative liner system that we have today where we take earth’s materials, we make them into stuff we want, use it for a while and then throw it away. We’ve got this take, make, use, lose culture that cuts against the living cycles of life and we need to flip those arrows around so that we start to regenerate. So, on the one hand, you need to allow earth’s natural biological materials to regenerate themselves. It’s why we need to have a food waste bin in the kitchen. All the food waste, all the biological material that we’ve been using, goes into that, can be taken back and either in your own back garden or in a municipal organic recycling center, turn back into living material in the world. But at the same time, we also need to turn all the materials that we create, be it from computers to tables, to buildings, to carpeting, all these synthetic fibers that we’ve created in the world, we need to reuse and restore those. There’s an example of a carpet company, very famous carpet company called Interface run by a man called Ray Anderson. He saw a video online about this cradle-to-cradle design and he had an epiphany. He said, “I want my carpet company to be living in this regenerative economy.” Instead of just ripping out old carpets and whoever had the building rip out the carpets, shove it in a skip and it gets land filled. Interface would say, “Well, actually, we will continue to own the carpets and when you’ve finished with them, we know where they are because they’re in your building, we’ll come and get them. We’ll take those carpet tiles away, we’ll take all the fiber off and 100% we’ll use that again. Then the glue that was stuck together, we can turn that into something for using roads and we can use the mesh again.” Using every part again. Having the factories, 100% based on solar energy. So bringing the economy completely into regenerative design. Of course, we were talking earlier about work and purpose, this man just lived with a light in his eyes. You could see it because he was so inspired by what he was doing and creating a regenerative company. The question is how do you get the finance, how to you get the business model that allows you to unleash this? Because I think 21st-century regenerative designers, they’re driven by a question that says, “How many benefits can we layer into what we’re doing so that we can give some away?” 20th-century finance says, “How much value can we extract from this?” That is a clash of transformative agenda meeting 20th-century capitalism. We need to transform finance and business models to unleash transformative design, rather than hold it back. Simpson: You argue that economists should stop thinking about themselves and their role as a mechanic that acts on the economy with a wrench but rather as a gardener that acts on the economy with a pair of sheers. I was hoping you might explain what you meant by that here on the podcast? Raworth: Yeah. The language we talk about the market is embedded, this idea of the economy as a machine. We talk about the market mechanism, market forces and this is harking back to the 1870s, when William Stanley Jevons and Leon Walras wanted to make economics a science as reputable as physics. And the physics of the day was Newtonian physics, so they wanted to make it an analogy. Newton showed that gravity pulled the bull to rest and so they said, well prices pull the market into an equilibrium, so they made this very mechanical language for the market mechanism. I think it also leaves economists in search of economic laws as if there were levers to pull on in this economic machine to pull it back into equilibrium. It’s just a very poor analogy and it leads us down the garden path, as it were, towards a garden because it’s a much smarter way to understand the economy through systems thinking. Starting not with the supply and demand curves of economics that are so constrained that they try and argue that prices will pull the economy into equilibrium, but rather start, with systems thinking. The fundamentals of that, which are balancing feedbacks and reinforcing feedback loops. Once you look at the world through the lens of feedback loops, things that spiral up, up, up, or down, down, down, and those are reinforcing feedbacks or balancing feedbacks, something that will bring it back to sort of level. Then you can start to understand so many things in the world, from your family relationships to the rise and fall of the stock market to the rise of the 1% to the crash of ecosystems. It makes more sense to look at it through a systems thinking lens. So I think economists need to be more like gardeners, realizing that the economy and economic interactions are ever evolving, have their own life, their own organic movement, but we want to design them towards the values that we hold. So it’s a matter of giving up, like you say, pulling on the wrench as if this market mechanism, it’s actually far better thought of as a market organism. Simpson: It seems to me that your framing naturally leads one to more long-term concerns. When you pull a wrench or a lever, you get a reaction. When you plant a seed it’s going to take some time, an investment of effort in order to get a result. Raworth: I think that’s a really nice point. And also, it comes with far less control, right? The person pulling a wrench on a machine believes they are stopping or starting or correcting something and controlling that machine. Whereas, when you intervene in the garden it takes a long time, you haven’t got control over it. And again, I think, this brings a certain humility to economics that it’s a complex, very complex adaptive system we don’t fully understand. It’s almost sort of gardening sometimes with blindfolds on, we don’t fully understand it. And that’s why people who are into evolutionary economics say that policy should be more like an evolutionary exploration. So you want to figure out how to improve girls school enrollment in districts of India. Rather than deciding what policy you think will work and implementing it, try different versions, try to experiment with different kinds of interventions in different places. So diversify, then seeing which one’s work, select and then those that work well, amplify. Again, always recognizing that there’s going to be contextual differences. But that idea of diversify, select, amplify, that’s exactly what plant breeders do, selecting the things that work because we don’t understand the system fully in advance, learn from it by engaging with it. And that’s what Donella Meadows and the system thinkers would say absolutely makes sense of how to dance well with a system. Simpson: For my last question, I want to start with a quote from your concluding chapter about evolutionary economics. “If economies change by evolving, then every experiment—be it a new enterprise model, complementary currency or open source collaboration—helps to diversify, select and amplify a new economic future.” Now, I quote that because I wanted to give you a chance to talk about the ways that Doughnut Economics is being picked up around the world and how certain urban planners are trying to take your model and use it as they plan for the future. Raworth: So sometimes you meet people who say, “Oh, I’m involved in a local cooperative and we’re developing open source software,” or “we’re setting up a complementary currency in our neighbor.” It can all sound a bit small and marginal and kind of niche activity. I often think it gets dismissed as that, hooky stuff around the edges of the economy. What I wanted to do with that quote is say, actually, this is the creation space of a new future. Just as the butterfly effect, the wings of a butterfly beating can set off the winds of change elsewhere, perhaps, these initiatives shouldn’t be regarded as odd, hooky things at the margins of the economy but rather, the place where new models are beginning. Because if a complementary currency or an employee owned business model or co-op works in once place, it inspires others who will then quickly take it and make it happen in other parts of the world. One thing that’s excited me is seeing the response of people to using the doughnut. The doughnut is an open source idea. It’s out there in the commons, anybody can use it and one of the beauties of that is people pick it up, use it and they make their own. So I was contacted by urban developers in Sweden and Stockholm who said, “We are creating a new suburb of Stockholm and we love this doughnut because it’s precisely the blueprint we’re looking for. We want to meet the needs of all of the inhabitants of this new district for healthcare, education and transport and energy and food within the means of the planet. Respecting the local ecosystem into which we’re embedding this new neighborhood. How do we do that?” They love the challenge. They’re calling it a doughnut district in Stockholm, one of the most livable city districts in the world. They say they want to start here, but we want to make them elsewhere. Again, modeling it there, trialing it, seeing what works and then take the ideas, the core principles of that design, to other places in the world. I was also contacted by a municipality and urban planners in Kokstad, which is the fastest growing town in KwaZulu-Natal in South Africa. They said, “We picked up this doughnut model. We loved it because we could turn it into our own. Working with the youth of the town we decided we had to add into the social foundation, fun because it should be fun transforming your economy and we’re using this doughnut diagram to revision the future of Kokstad. What town do we want to become? Don’t just grow spontaneously, sprawling without thinking about how we’re designing our town, but rather how do we make it a place that allows us to thieve? That distributes value to all of the participants and inhabitants of Kokstad. That values and thrives within the environment, the ecosystems that we’re part of.” So I love it when I see urban designers, or indeed, companies or communities or schools, pick up the doughnut and say, “We’re using this as a tool for ourselves.” That gives me hope because I think actually, a lot of the best ideas come bottom up when people take an idea, make it specific to their place, to their community, and turn it into their own. Simpson: Great. Well with that, Kate I think we’re out of time today but I want to think you again for joining me. Once again, this was Kate Raworth talking about her new book, Doughnut Economics: Seven Ways to Think Like a 21st-Century Economist. Raworth: Thank you very much. Lovely to be here.